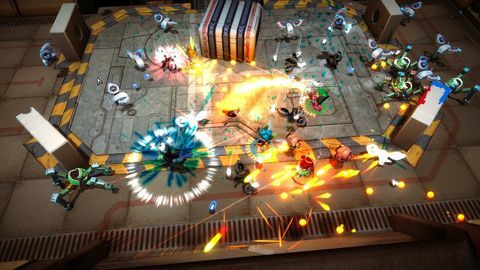 Sanatana Mishra is one-third of Brisbane-based indie Witch Beam, which has just released its debut title, a handsome and hellish co-op twin-stick shooter for up to four called Assault Android Cactus. Q: So you are a kind of a two-and-a-half man studio. What are your roles? Sanatana Mishra: I handle design, which I guess encompasses everything from gameplay to menu flow and that kind of stuff. Tim handles the art and programming, but he also works on the design as well – it’s actually his original concept, the game – and Jeff handles the sound effects and music. Tim is basically all over everything in the game, and me and Jeff are a little bit more specialised. Q: This is your first game isn’t it? How did Witch Beam come together? Sanatana Mishra: It’s our first game working as independents. Before that we have a lot of experience working in bigger studios. We all met at Sega Australia, which used to be Creative Assembly. We started out working on Total War games here in Australia for Medieval 2 and Medieval 2: Kingdoms, which are really cool games. Jeff was the audio director there, and I came in and started about eight or nine years ago now. 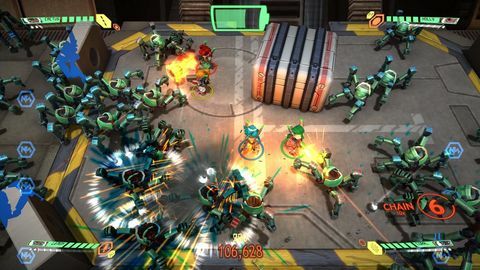 Q: For how long have you worked on Assault Android Cactus? Sanatana Mishra: Officially I quit my job and started working on it on February 1, 2013. Conceptually, Cactus as a character is someone Tim drew 10-12 years ago now, and had always wanted to make a game with her. The game itself is nearing three years of development now, but conceptually it goes back quite a way. Q: What was it like to leave your full-time position and go into something I’m assuming was much more uncertain pay-wise? Sanatana Mishra: Oh, it was terrifying! Tim and I have spent our life savings on this. Jeff has been doing other projects to go along. He has a family and a house and a mortgage, so he has a lot more responsibilities. In-between, Jeff did things like he was the audio director for Alien: Isolation, and he’s worked on a bunch of other small projects as well like Hand of Fate, Submerged, and things like that. Q: How has the game changed since that time (if at all)? Sanatana Mishra: Originally we had this idea of doing an action game. It was always Cactus as a character, a cool action hero kind of character. I think there was a lot more characters like this back in the day of Aliens, when it was more common to have cool female action heroes (which has died down a bit recently for some reason). 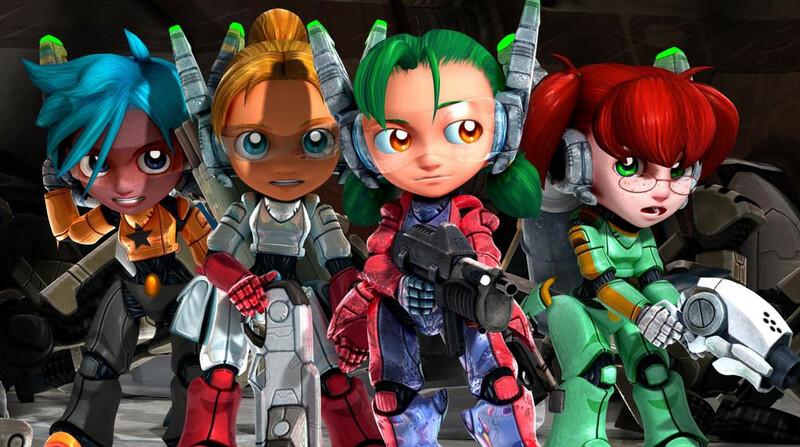 We hadn’t really developed the core of the game at the time, so the things that we really focussed on trying to make special about the game were the systems that drive it – the reason why you are compelled to keep playing, the reason it’s interesting to play compared to any number of shoot-‘em-ups or twin-stick shooters or arcade-style games. That’s what we focussed on: trying to build something uniquely compelling. I would say that the battery system that replaces your lives is at the core of what makes Cactus interesting. Being an indie developer is like being crash-landed out in the ocean with a light and a whistle, and everybody’s a million miles away. 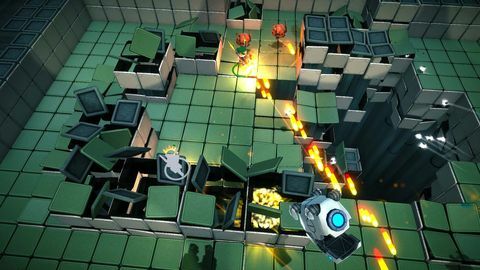 Twin-stick shooters in general rely heavily on defensive tactics, on finding safe space where you have the least amount of angles an enemy can come at you from. It’s kind of like… you read a lot of articles about the best ways to play Destiny, and a lot of them are focussed on exploiting the AI in some way so you can just stand someplace and just shoot them. That’s a really common trope in twin-stick games, where it’s all about circling away eternally, or standing somewhere safe. We wanted to move away from that, and promote more of I guess Japanese style, where you have an ever-pushing screen so you are not able to opt out of the next encounter – you are always moving into the danger. So, what we did was implement this battery system. The battery is constantly draining and doesn’t change its drain rate no matter what happens in the gameplay, and the only way to get a new battery recharge is to defeat a large number of enemies, whereupon a new physical object will appear out of an enemy you destroy, and you have to go and grab it. So what this means is even though you can play defensively, you actually can’t succeed unless you aggressively seek out the enemies as quickly as you can and destroy them, and then run through the level and engage with the level. So it kind of flips the traditional way you’d play these games on its head. It’s a bit of a double-edged sword in that it creates an intense gameplay experience – unlike any other twin-stick shooter I think this is the most intense experience because of that – but the negative is that it’s so intense that you get that “always at 11” feeling sometimes. We tried to balance that out by making sure that every level has a really core piece of identity that goes along with it. 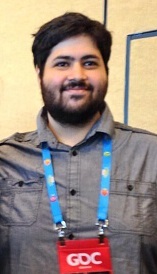 Q: What’s the worst thing about being a game developer? Tim and I have spent our life savings on this. Sanatana Mishra: Hmm. What do they say when you’re on a plane and they’re telling you things to do when you crash land in the ocean? You get this vest and it has a light and whistle for attracting attention. I think being an indie developer is like being crash-landed out in the ocean with a light and a whistle, and everybody’s a million miles away. That’s the worst thing. Q: Exposure, you think? Or just isolation in your work? Sanatana Mishra: Those are both valid interpretations of what I just said! Just the ability to attract attention is really hard, and you work at it, and it’s not necessarily inherently part of the ability to make a good or an interesting game, you know? It can be part of that, your concept of a game can sell itself. A game like Cactus for example – I think the inherent quality of what makes the game good is something you can largely only experience by playing it. So, we have to convince people to play it and tell other people to about it, which is really hard. 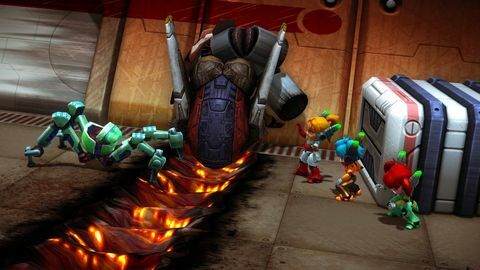 Android Assault Cactus is out now on PC, and is coming to PlayStation 4, Vita, and Wii U in Q1 2016.